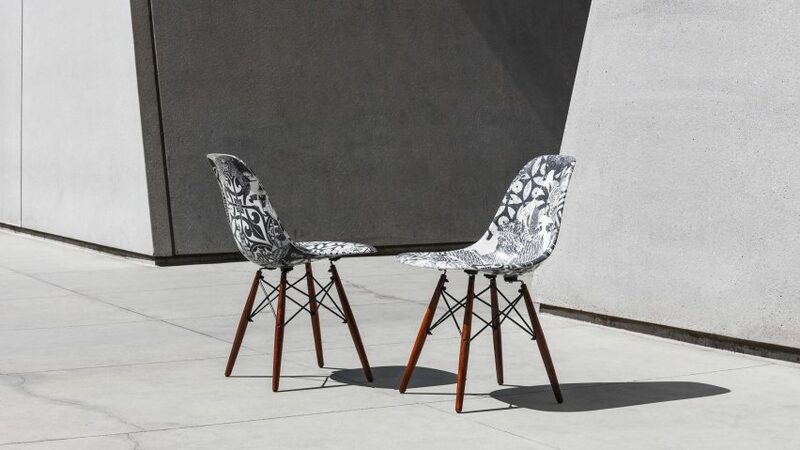 In a Los Angeles based art exhibition entitled “Beyond the Streets,” various contemporary artworks are applied to the classic mid-century modern dining chair originally designed by Charles & Ray Eames. 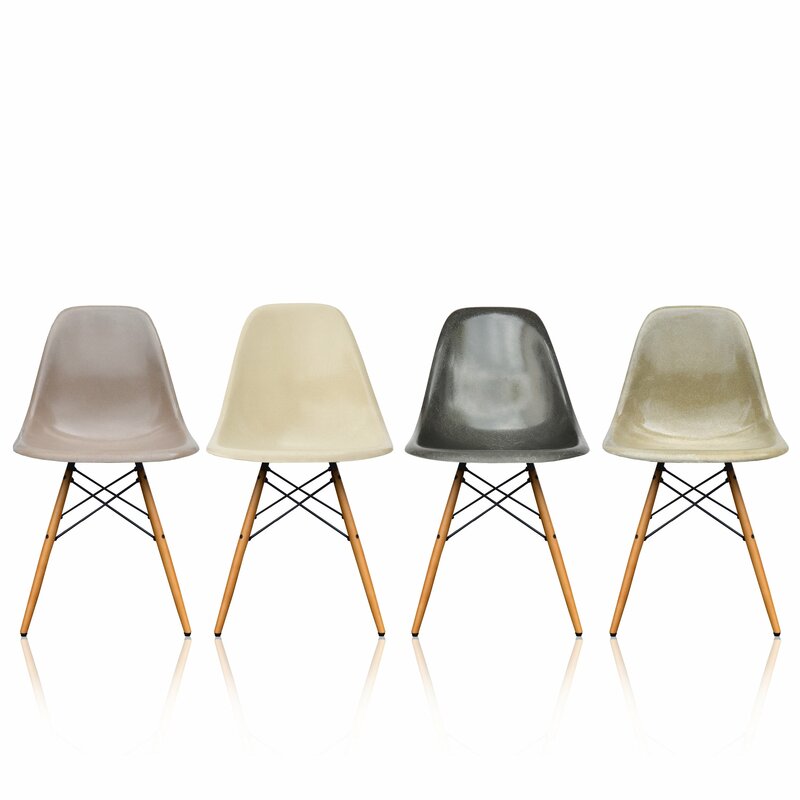 The shells of the chairs are made in Los Angeles using a mixture of resin and fiberglass and pressed using specialized equipment and the original machines that were used to make the Eames’ fiberglass shells in the 1950s. 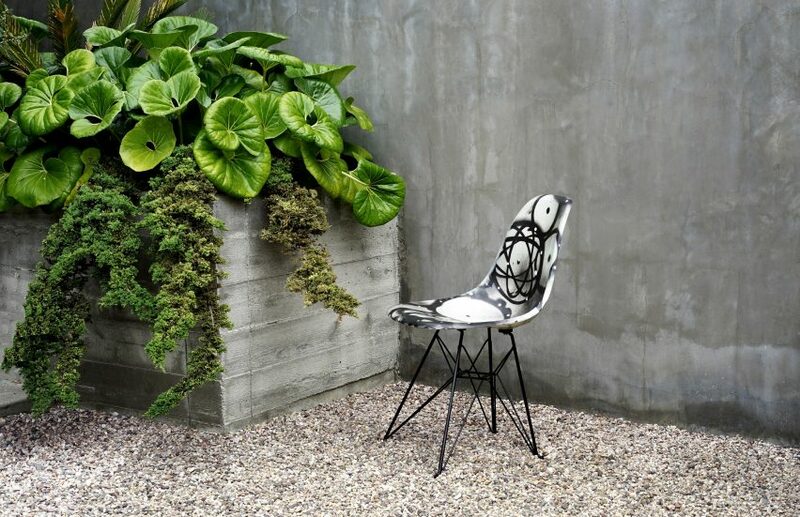 The artists, Shepard Fairey, Jean-Michel Basquiat, Keith Haring and Futura created custom designs on the fiberglass seats each being unique to their individual artistic style. The chairs are mounted on either a black steel or walnut wood dowel base. 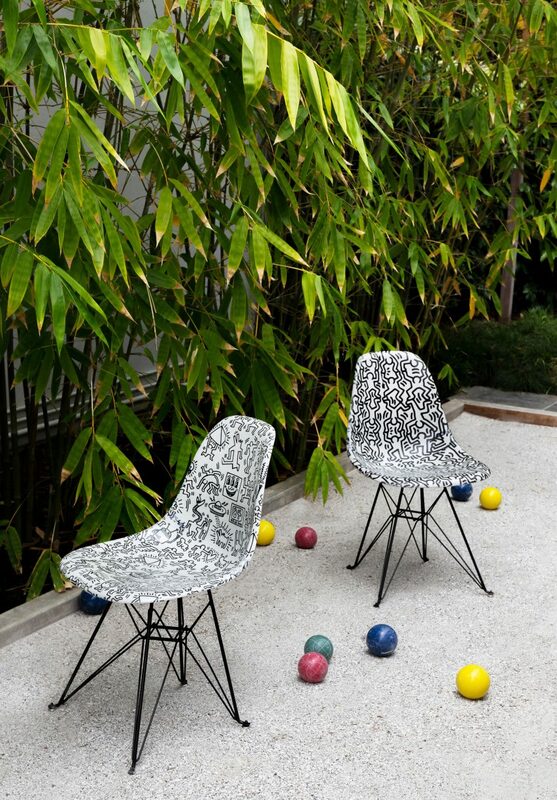 The series of chairs are limited edition as they will only be released in runs of 500. 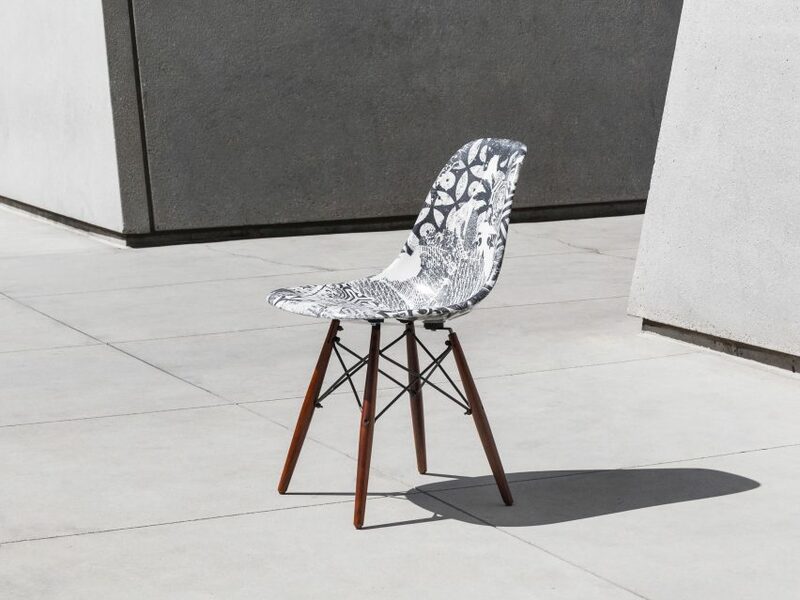 Fairey’s chair, which was the first to be launched, features a monochrome collage of patterns that have become signature motifs in his work. “My design is based on the collage foundation that can be found layered into all of my fine art, which uses a combination of patterns and motifs I’ve designed and found materials like old newspaper clippings,” said Fairey. “I think that this design approach brings to the forefront aspects of my work that usually are more in the background and will appeal to my audience, but I think that also will appeal to an audience that’s not already familiar with my work,” he added. Similarly, graffiti artist Futura’s custom shell design features his trademark spray painted atomic pattern printed in black onto a white shell. 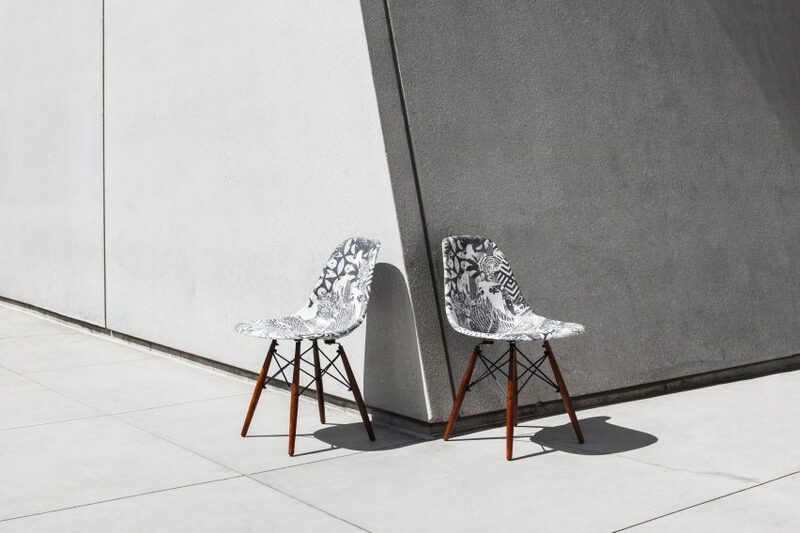 “Because I’ve never done a chair in the past, or furniture, it was about seeing what very recognisable design of mine, or pattern, could translate into this product and would look quite interesting and new,” Futura said of his contribution. “I wanted people to have something they could identify with me quite easily,” he added. In collaboration with Artestar, which represents high-profile artists, photographers, designers, and creatives, the estates of Jean-Michel Basquiat and Keith Haring each contributed two artworks from the American artists’ extensive portfolios. The Beyond the Streets exhibit spans over 40,000 square feet and is comprised of paintings, photography, sculptures, and large scale installations by over 100 international graffiti and street artists. 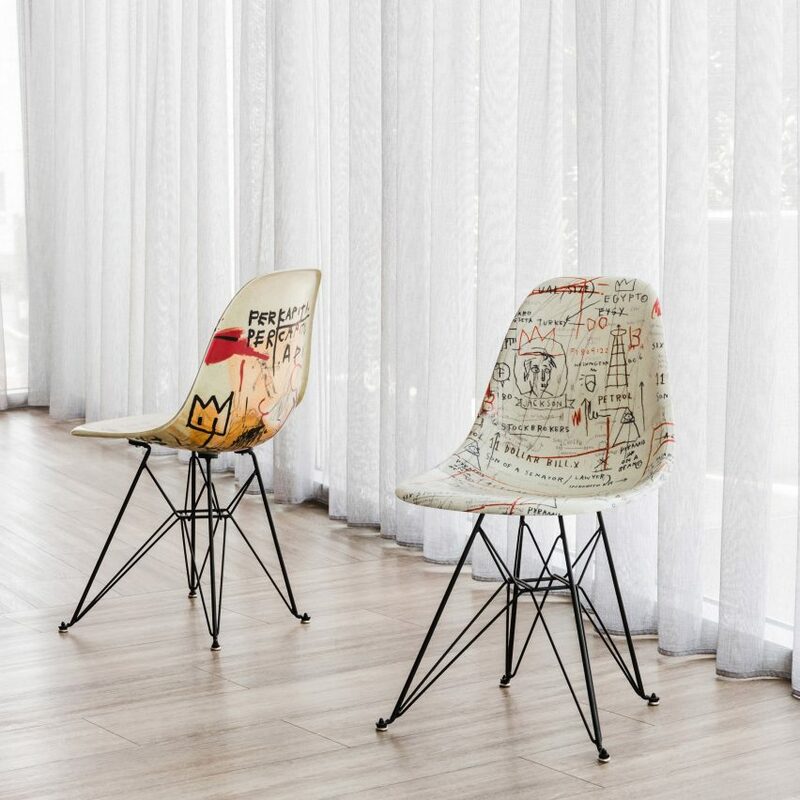 Shepard Fairey and Futura 2000’s limited edition chairs are available from the Beyond the Streets gift shop only, while Jean-Michel Basquiat and Keith Haring’s are also available online. The exhibition opened in May 2018 and will be on display until August 26th 2018.